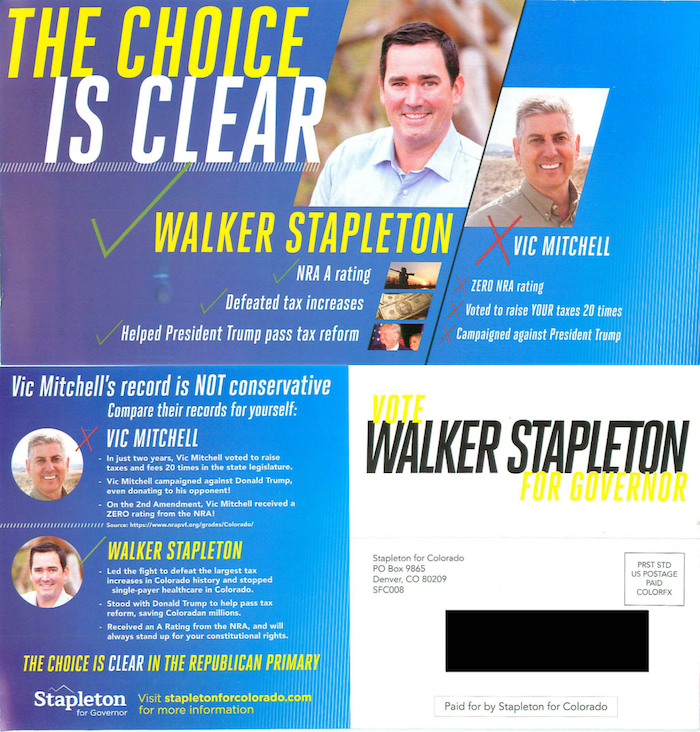 About the message: This mailer from GOP Treasurer Walker Stapleton criticizes Victor Mitchell, one his three opponents in the June 26 gubernatorial primary. It notes that Mitchell campaigned against now-President Donald Trump and voted to raise taxes and fees during his two years in the legislature. It doesn't note that the legislature must ask voters for any tax increase. The mailer does use different language about Stapleton's support of Trump's tax cut bill. He's been criticized repeatedly for a TV ad that says he was the only state treasurer to support the plan. About the messenger: Walker Stapleton is a Republican who has served as state treasurer since 2010. He won the four-way GOP June 26 gubernatorial primary. The messenger's money: Stapleton raised nearly $2.4 million through June 27, including $1 millionof his own money. He's supported by the independent spending committee Better Colorado Now, Coloradans for Fiscal Responsibility, Colorado Campaign for Jobs and Opportunity and Real Colorado Conservatives.